The author is a forage agronomist (retired) with the University of Wisconsin in Madison. The low futures prices for corn and soybeans have caused some farmers to consider alfalfa as a more profitable crop in 2018 than either grain. Current hay market prices in the Midwest are $197 for Prime quality (over 151 relative forage quality or RFQ) and $154 for Grade 1 (RFQ 125 to 150). Further, the market for hay looks good since December 1 U.S hay stocks, at 86 million tons, are the lowest since 2012, and before that the lowest since 1975. The Midwest is following the national trend and is 10.5 percent lower for December hay stocks than 2016. Also, with the cold weather, the Midwest has had along with little or no snow cover, the likelihood is high that some winter injury and kill will occur to alfalfa stands. The decision of which crop to grow will depend in large part on the production costs compared to a yield expectation and sales price. Table 1 offers an estimate of production costs by category from Minnesota and Iowa crop production budgets. It is important that you use these numbers as benchmarks and consider individual items will vary significantly across farms. I remember some years ago, when we were monitoring expenses on several farms, one farmer no-tilled alfalfa into a soybean residue field for a total establishment cost (including seed) of $97 per acre, and another farmer made eight tillage operations plus seeding and seed cost for a total establishment cost of $315 per acre! In that regard, if your numbers are significantly different from those in Table 1, you might want to evaluate why that is the case. In broad terms, Table 1 shows that corn has the highest production cost due to seed, fertilizer (nitrogen), and crop chemicals, while alfalfa production cost is somewhat less. However, alfalfa has high potassium fertilizer and harvesting costs (generally about $50 per acre per cutting for mowing, raking, and baling). The next step is to consider yield and value of the crop. Table 2 gives some return per acre estimates based on varying crop yields and prices. The middle yield in Table 2 is close to the national average yield. USDA-NASS reported 176.6 bushels per acre average corn yields (record high) and soybean average yields at 49.1 bushels per acre in 2017. NASS also reported alfalfa hay yields of 3.36 tons per acre, but remember that this does not include haylage, so a reasonable working alfalfa hay yield figure is 4.5 tons per acre. Average yields are from a broad range of conditions, so you must estimate what your yield potential is based on past history. 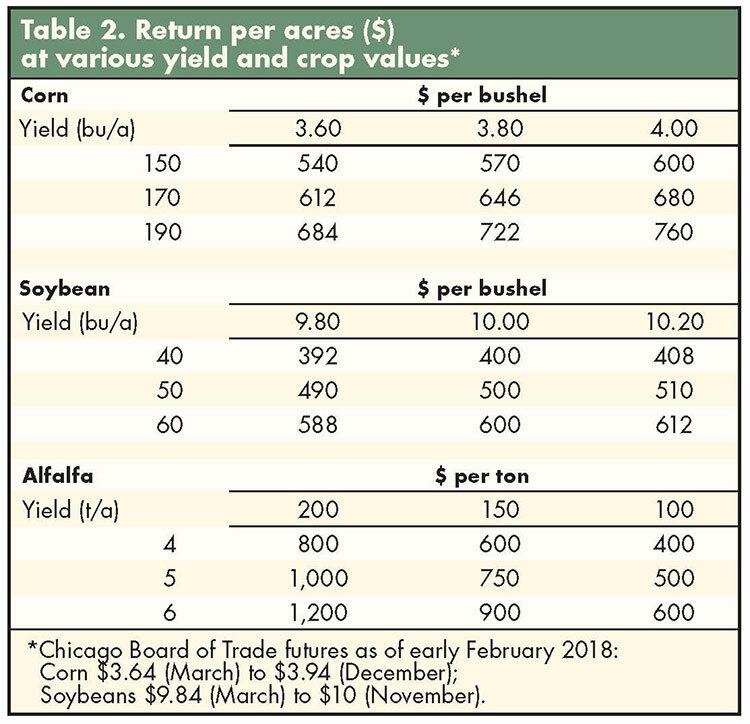 The corn and soybean values in Table 2 are based on Chicago Board of Trade futures for 2018. The hay values are from the Midwest, derived from the UW Team Forage Hay Market Report for early February 2018. Table 2 shows that corn and soybeans are about breakeven when both the production costs and a land charge are subtracted from the value of crop produced per acre unless the yield is significantly above average. Alfalfa has the potential for a good return in 2018, especially if dairy quality hay is produced. Note also that many states have significant horse and beef cattle numbers that can use less than dairy-quality hay. Another consideration is that many regions of the country now have access to contract seeding and harvesting operations. Thus, farmers can contract these operations and do not need to own the equipment to seed or harvest alfalfa. This may be the year to consider expanding alfalfa acreage. This article appeared in the March 2018 issue of Hay & Forage Grower on pages 22 and 23.